Artists illustration of Vector rocket fairing separation exposing payload before deployment. Credit: Vector Launch Inc. 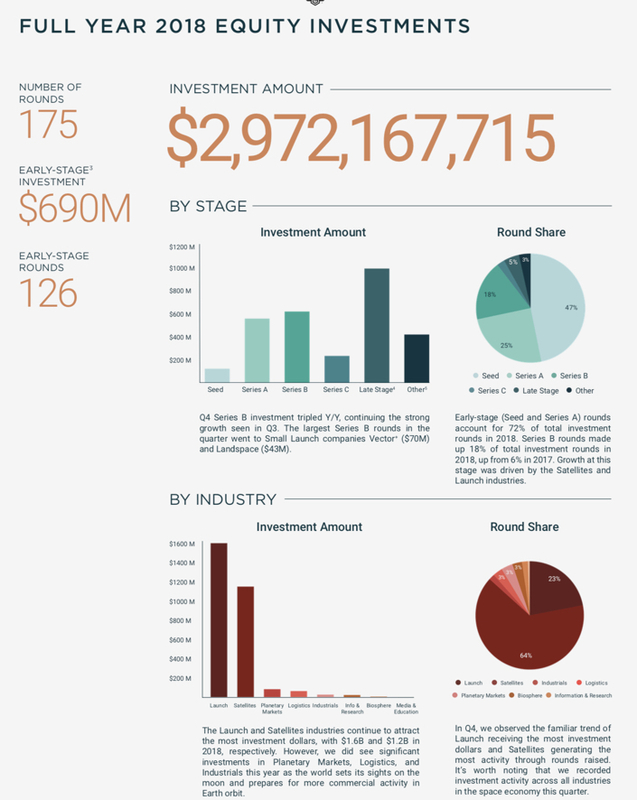 In total, the report states that US$18.0B has been invested into 412 space companies since 2009. Canadian companies made it into the discussion, as four announced financing deals valued at C$89M including NorthStar C$52M, Kepler Communications US$16M, GHGSat $US10M, and SkyWatch C$4M. Space Angels predicted that 2018 was going to be the Year of Small Launch. In fact, in 2018 the number of companies that joined the small launch sweepstakes rose to over 100 companies globally. Notably, two companies received significant funding, Rocket Lab US$140M and Vector Launch US$70M. In Canada, the Creative Destruction Lab (CDL) accelerator program at the University of Toronto started its first space stream cohort last summer. Heading into the third session later this month, some 18 companies remain in the program from the original 27, of which SpaceQ is aware of 3 that are small launch companies, 2 based in Canada, Loonify and Reaction Dynamics. Another 4 Canadian companies also remain for the third CDL session. As part of its program, CDL would expect that several of the remaining 18 companies would attract some investment before the close of the first years space stream. With 1 in 3 of the remaining companies being Canadian, it’s quite possible that 2 or 3 could attract investment. Other launch related companies receiving funding included Spaceflight Inc., the rideshare company which owns BlackSky, a company looking to launch a constellation of 60 satellites. They closed a Series C round of US$150M. SpaceX was also active and closed two rounds valued at US$773M. 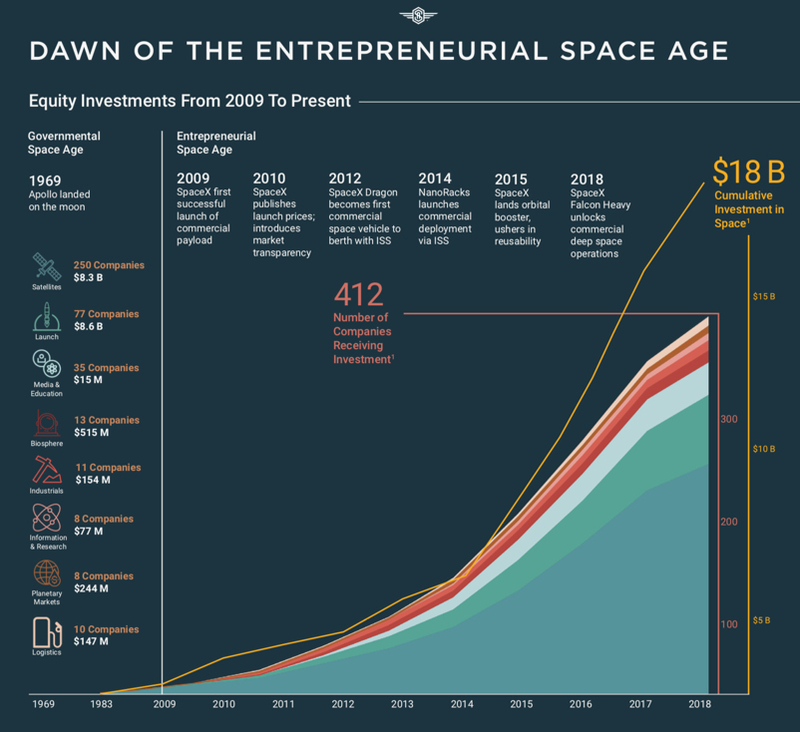 According to Space Angels, 2019 will be the Year of Commercial Space Travel.